I woke up at 5:45a.m. yesterday, December 16, to catch the official launch of Canada's newest national carrier, WINDmobile, at the Queen's Quay Headquarters location in Toronto, ON; all I can say is that it was absolutely worth it. Earning the spot of WIND's second customer ever in its young history, I was able to live-tweet (with frozen fingers at one point while standing outside in the beautiful yet Winnipeg-like winter weather) all developments. However, it was all worth it as I got a personal shout-out from the WINDmobile CEO, Ken Campbell. The WIND staff was (and still is) everything they were hyped up to be -- extremely enthusiastic (especially knowing that they'll have a steady job over Christmas), very knowledgeable, and determined to provide subscribers with the utmost standard in service and assistance. Of course, being a brand new company running on a brand new network, we were bound to run into problems. Transactions and activations took a bit of time, and I'm personally experiencing some expected network difficulties. Unlimited text IS available for $5/month. Not all stores are ready, only six opened today apparently. But ALL BlockBuster locations have opened. The number-porting system is NOT ready yet. WIND will NOT be unlocking phones because they claim it contravenes "Canadian copyright issues." NO SIM-CARD ONLY ACTIVATION UNTIL FURTHER NOTICE. The current HSPA network will upgrade to HSPA+, of course, just don't know when. The four released handsets will have to suffice for at least a few months. Android devices, Nokia N900, and Sony Xperia X10 coming soon. The AWS iPhone is coming soon, too! When I asked, the staffer said "no comment" with a smile. Data will be throttled after 5GB (more on that below). You don't want the hassle of cancelling or selling your current contract. You don't want any network hassle. Your carrier actually offers a damn good retention plan that suits your needs. You already have an AWS phone and you just need a SIM-card. You want to port your number from your current carrier. You're an exec with Rogers, Bell, or Telus. There are plenty of good reasons. Hey, just at Queen's Quay alone I'd say over 100 people did it within the few couple hours of launch! You believe that respect is a two-way-street, and customer service reps should be helpful and friendly. You don't want the hassle of constantly tracking your usage. You want to jump on the latest network. You want to promote better wireless competition in Canada. You head up wireless accounts for your company - $80 for everything unlimited is a damn good deal! Plus don't forget about super cheap handsets. Ah yes, my beloved new BlackBerry Bold 9700. Well, you've read all the reviews and seen all the pics, so I'll just say this: coming from someone who has NEVER owned a BlackBerry, BBM IS DAMN ADDICTIVE. I also love the WIND startup screen, reminds me of good times from this morning . The call quality is solid, the trackpad isn't wobbly. It's freakin' fast, and 200% gorgeous. The weirdest reaction: I've been using my 9.9mm thin Sony Ericsson W890i for over a year now, and I've been quite accustomed to firing off messages at bullet-speed on one of the slimmest and smallest phones on the market. Believe it or not, I actually found the 9700 keys really small!! Now I kinda know why the 9000 owners were upset. Yet, I still wish for an even slimmer Berry to be released in the future. A very, very special thank you goes to the CrackBerry.com community. This BlackBerry Bold 9700 is in my hands because of your votes for my APPLECALYPSE short film in the CB "I Love My CrackBerry" Contest!! And from the great teamwork and discussion in the CB Forums, I've been able to learn to use my BB so much faster than without your tips and tricks. While I am very impressed with WINDmobile even walking in yesterday morning with high expectations, there is still one issue that concerns me: WIND's release of their "fair use policy", which dictates that massive usage in the "unlimited" plans will be monitored and, especially in the case of data, potentially throttled. They have already admitted that 5+GB of data usage will result in throttling due to optimal "network management", but they have refused to disclose the lengths and limits to which they are willing to go. Given that they are a new carrier shining in the spotlight against the ugly background of Rogellus, to maintain their "power of conversation" community-based mantra they must refine such policies while allowing further transparency and accountability. All this said, I have zero regrets about switching, and I intend to look back ten years from now and say, "Well, it's been great, WIND...let's toast to ten more years"! 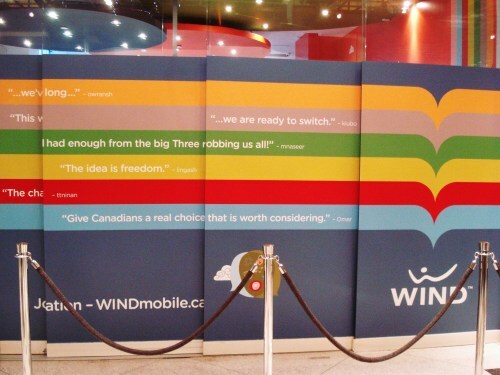 WINDmobile's entrance into the Canadian wireless market, sustainable or not, at the very least brings some much-needed competition and more value per dollar.